There are currently 46,560 users on this website. 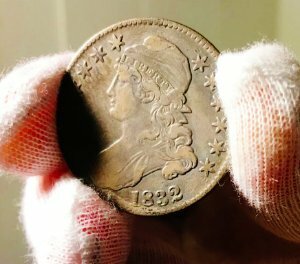 The rim of this coin -- an 1832 Capped Bust half dollar -- feels "thin," like what you would expect on a slick or other heavily worn coin. 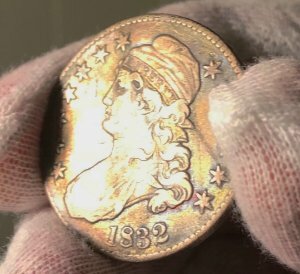 I'm not an expert on capped busts, so I'm wondering, is this typical of this series? Does it look thin in the photos? 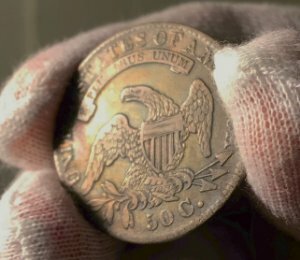 And what would cause the lettering on the rim and the rim itself to degrade much faster than the rest of the coin. Any help is much appreciated. Thanks! looks totally legit to me. Did you weigh it? Looks normal to me. CBHs from this time period have a lettered edge. Looks normal to me. 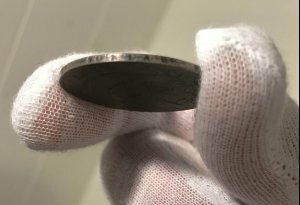 Nice coin! Thanks, everyone, I appreciate the input and opinions. Mike F, great idea, but I don't have a scale, unfortunately, so can't confirm the weight. 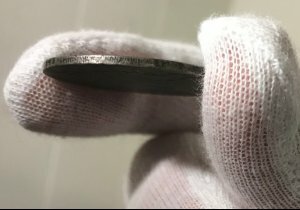 If you're going to be buying raw coins you need to buy a digital scale. I don't know what state you are in but if you google 'head shops near me', in most states, these sketchy shops will provide you with a good assortment of digital scales.